I am not my hair…actually I am! Home > Uncategorized > I am not my hair…actually I am! On March 5, 2013, I wrote a blog post I am not my hair. I had lost my hair due to the chemotherapy sessions I was undergoing and I was hiding under a wig. Once day my good friend Sylvia, a photographer decided, enough is enough and decided a “bald” photo shoot was in order. Fast forward 6 months later and my hair was back! Losing it was a stark reminder that I was ill, a reminder that I tried to hide from others and myself. I always felt, as do most women, that my hair was my crown jewel, that it was the essence of womanhood. But now my hair, just like my diseased breast, was failing me. Falling away with no consideration of what its departure was doing to me. The last vestige of perceived beauty was gone from me. It’s funny what a recovery from a deadly, nasty disease does to your perspective. Oh the things I did to look beautiful back then, too numerous to count. My hairless self (when I finally threw the wig away) continued to receive compliments about how good I looked even when I was in the throes chemo and radiation. I realized then that the beauty was in being alive, was in smiling and showing off my incandescent row of teeth even when I felt least like it, it was in winning my fight against breast cancer. And win I did, since completing my treatment a year ago, I’ve had several medical reviews with the most recent a few days ago, in October 2014. The doctor gave me a clean bill of health. Hearing those words was as dumbfounding to me as had been my diagnosis of Stage 3 breast cancer the previous year. The fear of illness and dying had left me, I was now free to fear mundane things like whether the guy I liked would reciprocate his affections, whether I was the best mum I could be to my boys, whether I was a good friend and sister and daughter, or a good employee like I aspired to be. I tell you, perspective should be bottled and sold! My new hair is short with little curly rivulets, the kind of hair I’ve always wanted but never seemed to achieve with all the pomades on the market. It’s wash and wear kind of hair, a symbol of how far I’ve come. I love my new low maintenance hair. And guess what, so does my guy! 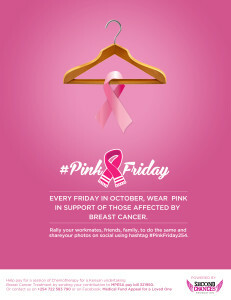 This being breast cancer month, I’d be amiss if I didn’t remind you that you are your first line of defence. It only takes a few minutes to do your breast self-exam, do it once a month and remind your girlfriends to do the same. There’s no time like the present. Early detection is critical for treating and conquering breast cancer. It is not a death sentence; it is a journey that can be overcome. I am living testament. 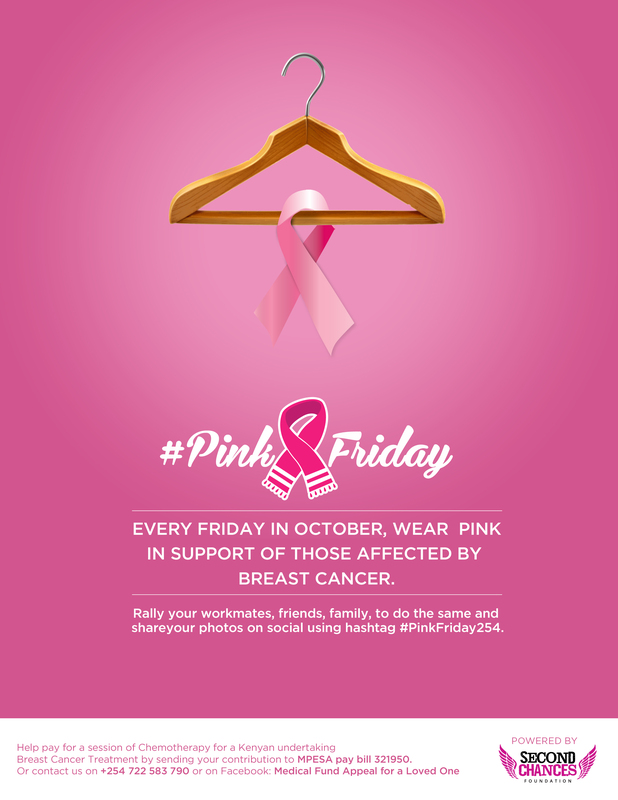 This Friday and every Friday in October, wear something pink, and send your selfie to #PinkFriday254 on social media. Take a breast self-exam, eat a little healthier, talk a walk or do some exercise, visit and encourage someone going through cancer. Thank God for your health. I do every day.